Why Stay at the Apache? The Apache Motel has a fascinating history in the movie industry. Wild western director John Anson Ford and John Wayne spent many colorful years in the Moab and four-corners area, and usually stayed at the Apache Motel when they did! 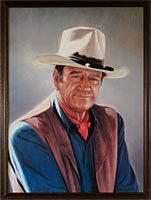 Stay in the motel where John Wayne stayed! TIP: Our rates are substatially lower than theinternet rates if you call and make your reservation directly with us. Why? Because when you make your reservations directly with us, we don't have to pay the travel agencies and reservation companies their commissions and fees. The average rate in Moab for a motel room for 2 adults and 1 child with two queen beds is well over $100 (excluding the events and celebrations of 10 or 16 days of the year). The average rate for the most budget oriented room in Moab with 2 double or queen beds with practically no amenities is over $100 a night..
At the Apache Moetel you get free continental breakfast, loads of amenities, 2 queen beds, refrigerator,microweave oven, hair dryer, plus much more for $89 per night. I ask you, why pay more each night when you can stay in comfort for less?? Call us Toll Free 800-228-6882 for your next reservation.